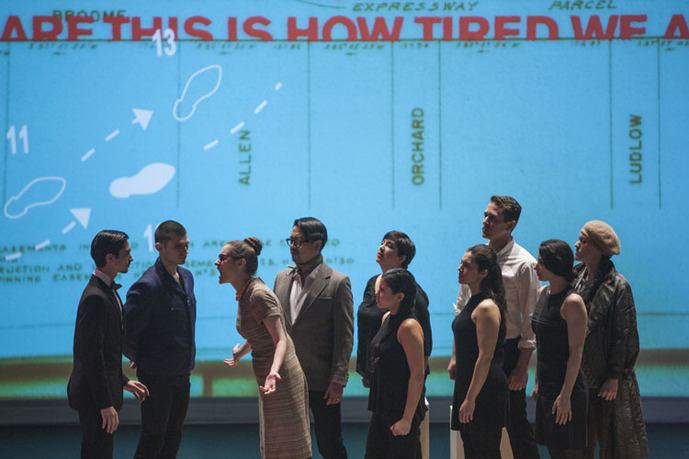 Still from A Marvelous Order: An Opera about Robert Moses and Jane Jacobs, Williams College, 2016, Williamstown, MA. Photo: Roman Iwasiwka. 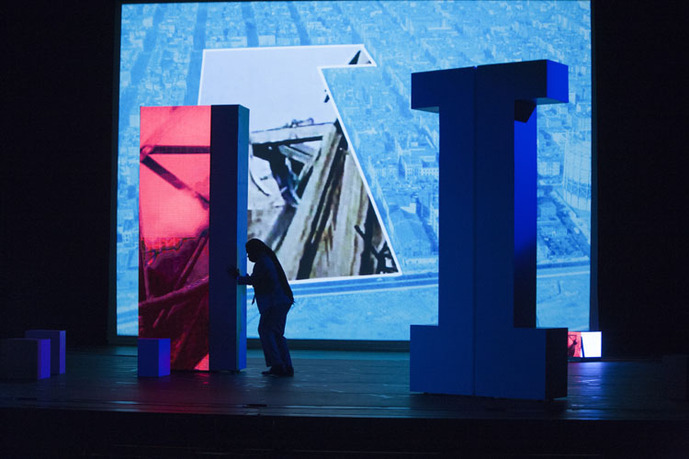 A Marvelous Order is a new multimedia opera about Robert Moses and Jane Jacobs. 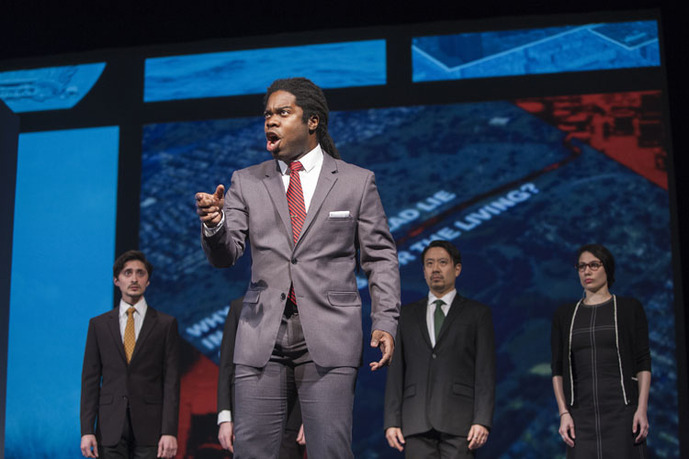 The opera tells the story of the battle between these two brilliant visionary urban theorists during the 1960s over the fate of Washington Square Park, Lower Manhattan, and Jane Jacobs's own home. It is a story about the people who live in cities and how the decisions made on their behalf by those with authority, and those who resist that authority, tangibly impact their lives. 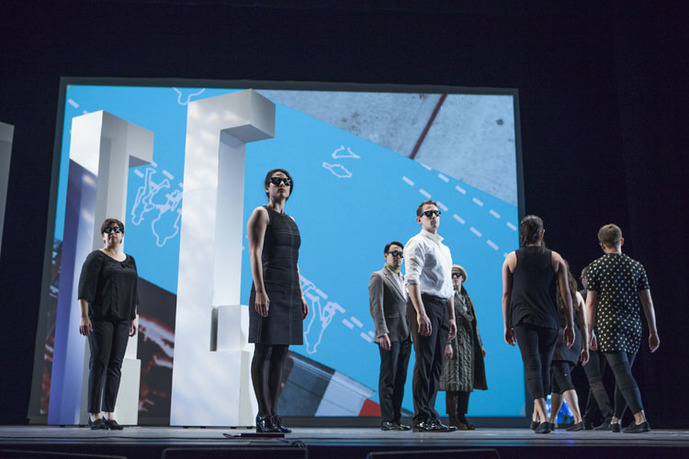 The opera is being realized through a deeply interdisciplinary process combining Tracy K. Smith's words, Judd Greenstein's music, Will Rawls's choreography, and Joshua Frankel's animation and direction. Joshua Frankel is a director, animator, and visual artist. He grew up in Hell's Kitchen, New York City in a building filled with musicians, actors, and dancers, and spent most of his youth listening to hip-hop and trying not to let anyone take his lunch money. His work has been presented by institutions including the Brooklyn Academy of Music, the Library of Congress, the London Institute of Contemporary Art, the Film Society of Lincoln Center, the New Museum, the Annecy International Festival of Animation, and the UN World Urban Forum. He was a member of the groundbreaking digital team for President Obama's 2008 campaign and is an alumni of the Sundance New Frontier Story Lab. Frankel has also created over twelve thousand square feet of public murals in collaboration with his wife, artist Eve Biddle. Judd Greenstein was born and raised in Manhattan. He received his undergraduate degree from Williams College, and his master's degree in music composition from the Yale School of Music, where he studied with Martin Bresnick, Aaron Jay Kernis, and Ezra Laderman. Shortly after Yale, Greenstein began to draw attention in the New York classical scene for his music's pulse-driven quality and "impressive confidence," performed at Carnegie Hall, Tanglewood Music Center, and the Tribeca New Music Festival. The New Yorker critic Alex Ross also regularly lauded Greenstein's work as early as 2005. Since then he has received dozens of commissions, and has had his music performed at leading classical music festivals including Bang on a Can Marathon Concerts, Tanglewood, the Carlsbad Music Festival, and the MATA Festival. Tracy K. Smith is the author of three books of poetry: Life on Mars, which received the 2012 Pulitzer Prize; Duende, recipient of the 2006 James Laughlin Award; and The Body's Question, which won the 2002 Cave Canem Poetry Prize. She has also been the recipient of a Rona Jaffe Award, a Whiting Writers' Award, an Essence Magazine Literary Award, and a Wallace Stegner Fellowship from Stanford University. She is professor of creative writing at Princeton University. Will Rawls is a choreographer, performer, and writer based in New York City. He was a MacDowell Colony Fellow (2013) and a recipient of a grant from the Foundation of Contemporary Arts (2015).